On three out of every five days this year, Wall Street's leading firm has made at least $100 million trading stocks and bonds, and creating and entering into derivatives contracts. 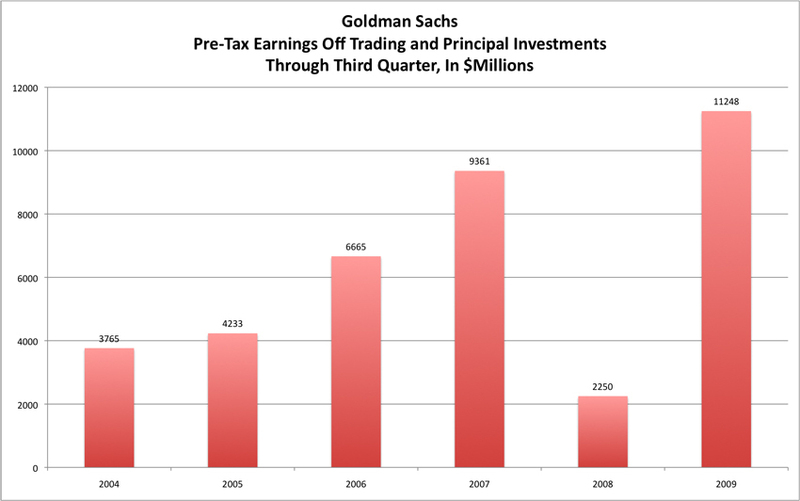 Out of 194 trading days through the end of September, Goldman Sachs earned at least $100 million from its trading division on 116 of them. The firm lost money from its trading activities on just one day during the three-month period ending in September, federal regulatory filings show. It made at least $50 million on four out of every five trading days. 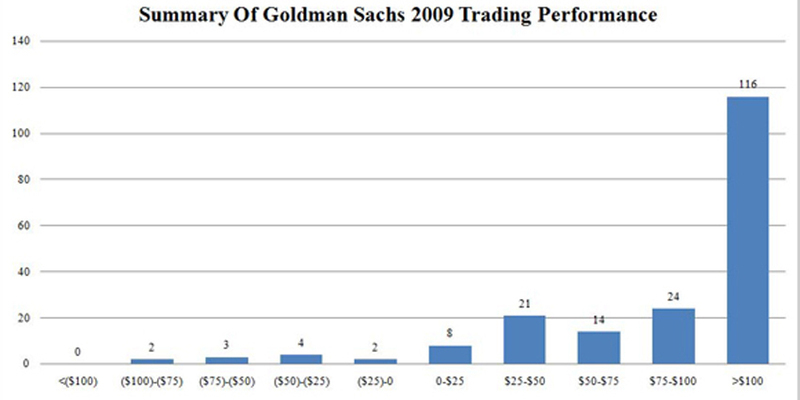 The documents show just how much of a trading firm Goldman Sachs has become since the financial crisis mushroomed in September 2008. The firm generated about $4.5 billion in pre-tax earnings off trading and investments during the third quarter, compared to a $761 million loss in the same period last year. Income from other segments of the firm has dropped. Through the first nine months of the year, the firm earned about $1.3 billion off investment banking and managing assets for clients; during the same period last year the firm earned $3.7 billion from those same activities. As the influential financial blog Zero Hedge puts it: "When a firm's trading performance challenges not only all preconceptions of realistic trading, but also of statistical distributions, one can merely stand back and watch in awe."